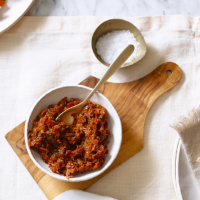 Kasundi works brilliantly with slow-cooked lamb, but can be served with just about anything. 1. Deseed and roughly chop the tomatoes. Put in a bowl, season and stir; leave to stand for 1 hour. Meanwhile, warm the vinegar in a small pan and add the mustard seeds; leave to infuse for 10 minutes. 2. Heat the oil in a large pan until warm then remove from the heat. Add the coriander, cumin and nigella seeds, cloves, turmeric and chilli powder. Leave for 1 minute then add the mustard seed and vinegar mixture plus the garlic, ginger, chillies and onion. Return to a low heat and cook for 10 minutes. Tip the tomatoes into a colander to drain the excess liquid, then add to the pan with the apple and sugar. Bring to the boil then reduce the heat to low and cook for 1 hour 30 minutes. Increase the heat to high and bubble for a final 10-15 minutes until thickened; season. It should be sweet with a fi ery heat. This recipe was first published in March 2019.